Where a passerby sees a pile of rubble, a demolition salvage expert sees the material for future building projects. And a city official may see the chance to slash the regional landfill rates. 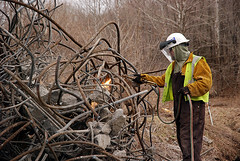 Here in the Portland area, Metro has found that construction and demolition debris makes up 26% of the region’s waste. The national number is even higher—Americans produce 136 million tons of construction and demolition debris every year. That means about 40% of this country’s waste comes from construction and demolition sites. Fortunately, demolition experts are finding new ways to recycle building materials. Beyond helping the environment, asset recovery demolition specialists are motivated to help clients recovery as much value as possible from buildings slated to be demolished. Many building materials can be recycled, but construction and demolition sites still create some waste. States often require 90-95% of construction materials to be recycled, so project managers must be careful to follow the letter of the law throughout the demolition process. Here’s the waste created by an average demolition site, along with any relevant recycling potential for each waste material. —Radioactive waste from highly calibrated measurement equipment and other industrial applications. If improperly disposed, radioactive demolition waste can poison environments and threaten human health. —Steel Our buildings’ skeletal structures are concrete with steel “bones.” Steel’s strength allows us to build skyscrapers. It is also highly recyclable. —Recovered fixtures such as sinks, lamps, and toilets. —Building innards such as dry wall, insulation, nails, windows, and trim. Dry wall can be recycled, and other components such as doors and windows can be reused or salvaged. —Asphalt shingles which are sought after for the petroleum they contain. Asphalt roofing may be repurposed for the construction of new roads. —Hazardous building materials including asbestos, toxic adhesives, and lead-based paint. —Circuitry including electrical, plumbing, and HVAC components. May be salvaged for materials or repurposed as is in new construction. —Tree stumps and other landscaping elements that can’t be preserved during demolition. States’ and cities’ natural resources departments regulate how construction and demolition debris can be handled, recycled, and disposed of. Burning is often banned, as is burying waste at any location other than a permitted landfill. Municipal, state, and federal regulators may charge hefty fines for demolition disposal violations, particularly those involving hazardous waste. A California waste handler was recently fined $243,000 for illegal dumping of hazardous waste. And the New Jersey Department of Environmental Protection recently fined T. Fiore Recycling and T. Fiore Demolition $2.9 million for failing to remove demolition debris. For the environment and for the bottom line, effective demolition asset recovery is key. This entry was posted in Asset Recovery, Scrap Metal Demolition and tagged demolition and salvage, demolition asset recovery, demolition salvage. Bookmark the permalink.